On the other hand, I recognize how such widespread access to technology has greatly democratized picture taking. It helps create citizen journalists, which in general is a good thing. But it creates some problems. As I was photographing refugee families in South Sudan recently, the children kept wanting to see the back of my camera, obviously having been afforded that privilege by others. If I rebuffed them, the more brazen kids would grab my camera to try to see for themselves. I usually avoid showing people images on the back LCD, in part because it runs the camera batteries down faster and takes time away from capturing more images. I don’t mean to sound snooty, but I’ve got a job to do. On the other hand, people have a right to see what I’m capturing if they ask me to take a look. And it can be a way of affirming the beauty and dignity of people who often don’t possess a decent image of themselves. It can generate a good bit of giggling and fun when kids take a look at themselves. And, in what always seems to be to be the ultimate gift of selfless hospitality, it usually provokes the person whose image I have captured to thank me for taking their picture. That’s humbling. This tension doesn’t arise as much when someone else is along who can take pictures and share them. Yesterday in Mindanao, I traveled with Ciony Ayo-Eduarte, the director of UMCOR’s work in the Philippines. She carries a DSLR around in the course of her work, and has produced some good images. 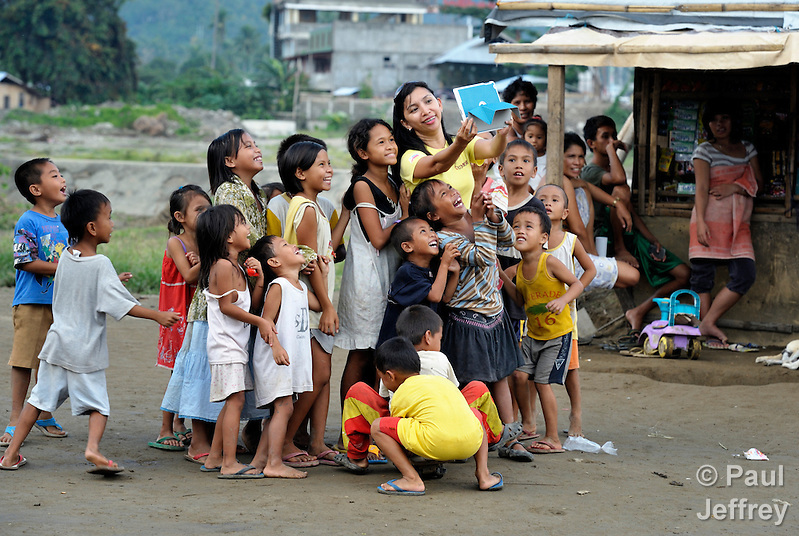 She also often carries an iPad, and in one stop in a riverside community where people were recovering from Typhoon Bopha, which had struck just two days before, she started photographing the kids, and then capturing video of them as they horsed around. Then she graciously showed them the result. It’s a magic moment. Humanitarian groups like UMCOR, whose brand includes the phrase Be there. Be hope., offers survivors the normal variety of emergency services, from food to workshops on disaster risk reduction. But there are also small moments like these, when people like Ciony give those who suffer in too many ways a moment to celebrate that they are still alive, still laughing. December 7, 2012 | Filed under Picture of the Week. You are such a good story teller, Paul! With your words as well as your photos. Thank you!